There are 153 guests and 0 registered users on-line. Mark May has recorded and contributed to a wide variety of music. Here's the evolving collection -- please email us if you know of others we should add -- and yes, we'll remember to ask him too! Our lyrics section is up and running. These lyrics are solely for your personal enjoyment in understanding the lyrics to the songs -- they are not to be used in any performances without obtaining proper licensing -- they are copyrighted as shown! Please feel free to submit lyrics from Mark's songs and we'll add them here. Texas may have produced more great unsung blues guitarists than any state in the nation. Mason Ruffner and Chris Duarte come immediately to mind as virtuosos who have labored in relative obscurity for years. Maybe it's the stiff competition that makes it so hard to break out of the Lone Star State. Had David Bowie and Jackson Browne not championed Stevie Ray Vaughan, he might never have transcended the Austin blues scene. It appears that, in order to break out from the blues pack these days, an artist must either be a teenage wunderkind or have the help of an industry insider to grease the wheels. 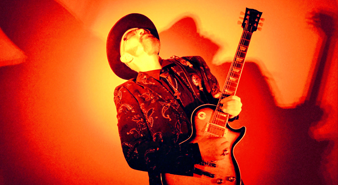 If a guitarist was ever worthy of such greasing, it's Houston's Mark May, the best guitarist you've never heard of, and arguably the most versatile talent working the blues today. He lets fly on his third album, "Doll Maker," the follow-up to 1997's brilliant "Telephone Road." Don't think Mark's been idle during the interval; he spent two productive years touring as Dickey Betts's guitarist. The "Doll" is in the House! Mark May's newest CD "Doll Maker" has arrived! To hear sound clips, click Media Gallery on the Menu, then click Sounds. If you want to hear entire songs, request 'em on Radio HTW. "Doll Maker" is available at all the stops on Mark's tour and is available in the Merchandise section of this site now!